The Ultimate Collector's Edition (Blu-ray + Blu-ray 3D + DVD + Digital Copy) of Wreck-It Ralph looks beautiful before even opening the package. The cover has a slick 3D holographic card on the front of the blu-ray dust cover case where it looks like Ralph and Glitch are stepping right on out of the package. The dust cover is a golden color but with a shine to it such that other colors such as reds and greens appear depending on how the light reflects on the case. The combination of the holographic card and the shiny gold slipcover makes for a very eye-catching presentation. Paperman Theatrical Short -- A young man in an office sees the girl of his dreams in a skyscraper window across the street. But how can he get her attention? Bit By Bit: Creating The Worlds of Wreck-It Ralph -- Game jump through the worlds of the film with the filmmakers, artists and animators who created it. Video Game Commercials -- Original commercials for Fix-It Felix, Jr., Hero's Duty and Sugar Rush. So I don't have a 3D television so I couldn't check out that disc, and the digital copy is basically just for copying to your computer or portable phone or whatever if you want to watch it there, which I understand could come in handy but for me I only want to watch on our big screen, so I skipped that disc as well. The DVD is nice since most people likely don't have blu-ray players connected to every television, but for me the main disc to check out was disc 1, the primary blu-ray disc. Even though I didn't have the 3D effect while watching it in high-def it still looked absolutely stunning. There are several different styles of videogame worlds presented in this movie and they all have their own unique style. The Sugar Rush candy world is where most of the time is spent, and the candies and treats are textured so well and so detailed that I start craving candy every time I watch it (which has been at least 3 times on home video so far). Of course, looking fantastic wouldn't matter much if the characters and story are crap, but luckily both that ain't the case. The characters feel both like actual videogame characters and real people with emotions and problems. I imagine it must have been quite difficult to walk that line but they sure pulled it off, and both the animation and the voices help to sell it. 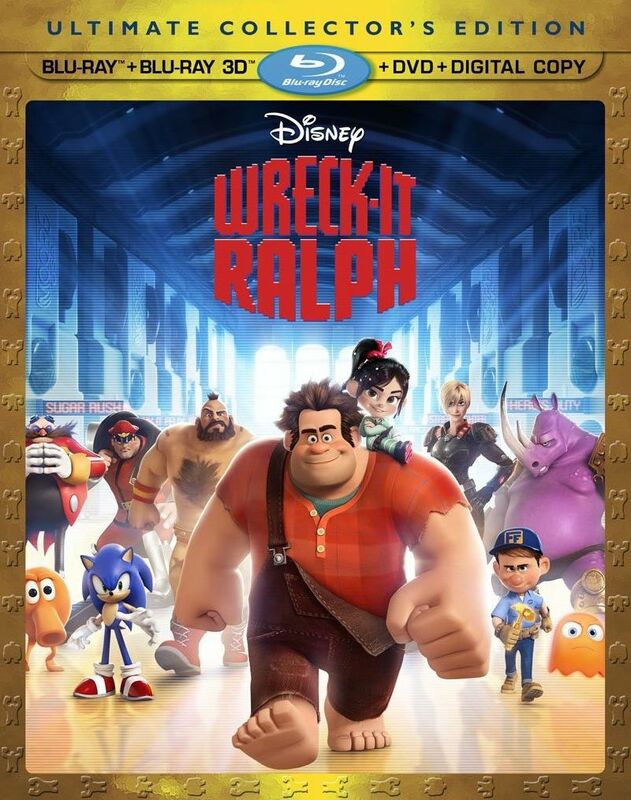 John C. Reilly voices are lead character, Wreck-It Ralph, with Jack McBrayer voicing "good guy" Fix-It Felix Jr, Sarah Silverman voicing Vanellope, and Jane Lynch voicing Sergeant Calhoun. I really don't want to summarize the story because, at least for me, it was really enjoyable to go into it not really knowing anything about the plot and just seeing where it went, but I will say that it was cool to see all those classic videogame characters that I grew up with make cameo appearances. It brought back a lot of good memories, which could be another reason why I love this movie so much. But even if you weren't a gamer, this movie still has a lot of heart and is definitely worth seeing. There's also some videogame commercials that were created for the made-up videogames in the movie, Wreck-It Ralph, Surgar Rush, and Hero's Duty, which I felt was a nice touch to make them seem like real games. Then there's a blu-ray feature where when you pause the movie a dude appears to give you a look at a bunch of the videogame references used in the film, among other stuff. In short, this is a great movie packed in a nice collection so I see no reason why you shouldn't go pick it up for yourself. Join Wreck-It Ralph director Rich Moore in this exposé about the one time Fix-It Felix Jr. high score champion Garlan Hulse, his fall into obscurity and his attempt to be on top again. LEVEL TWO: THE CREATION OF THE WORLD OF FIX-IT FELIX JR.